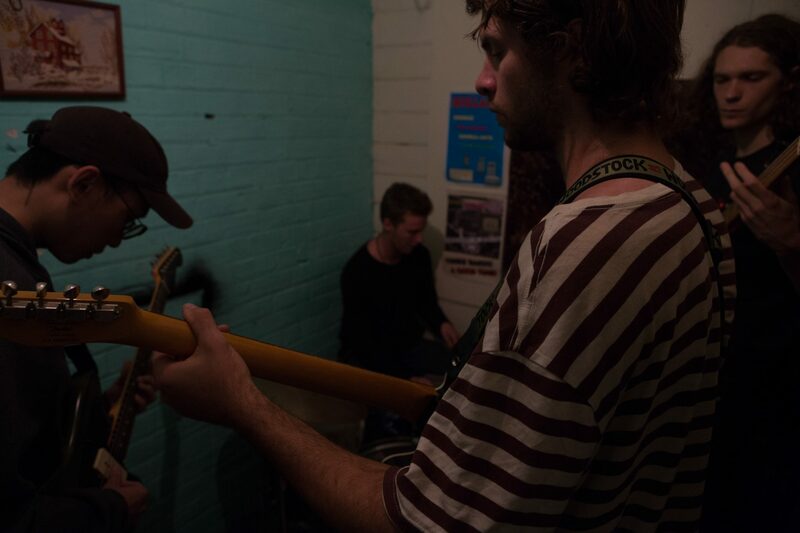 On their debut album, Melbourne punks Bollard aren’t afraid to take things to their extremes. Trawlers explodes with sprawling guitars, driving beats and ominous vocals, and across the dark and light moments of the album, we see the band look at either side of the same intensely angst-ridden coin. Trawlers kicks off with the band proving how chaotic they can be. In fact, it almost plays like a challenge to listeners, warning them that if they can’t handle the sinister intensity of the opening tracks, they might be safer finding something else to listen to. ‘Meningococcal’ is potentially the darkest and weirdest track on the album, and an incredibly bold move to begin with. Based around a revolving bassline, the track ebbs and flows for more than six minutes but never settles. Filled out with eerie guitar chords, rattling percussion and monotonous spoken vocals, it plays like the soundtrack to some kind of horror story. ‘Meningococcal’ bleeds into ‘Windows’, which despite sharing a similar level of intensity flips things on its head. Driven by a pounding rhythm section, the track is packed with abrasive guitars, angsty vocals and some terrifying lead riffs - and when frontman Tom Walsh sings “all this chaos is such bad news”, it feels like a proper introduction to Bollard. Followed by tracks like the sprawl of ‘Some Familiar Spectre’, the mess of warped guitars on ‘Art Approximates Life’’ or blown out ‘En Bloc’, it’s clear that wild and threatening is Bollard in their most natural form. However, there are some moments of calm amongst the treachery of Trawlers. ‘Ham’ finds Bollard at their least abrasive, with a tangle of guitars that might almost feel woozy if it weren’t for the track’s sinister undertones. ‘Touchline Fever’ is another moment where things cool down as Bollard weave masterful guitar lines around each other. However, the sudden bursts of noise that fills the track out remind us we can’t feel too safe anywhere on the album. Similarly, ‘Gloom’ is a lo-fi ditty that could almost be charming if it weren’t so dark - plus, as it leads into the album’s final track ‘SPF 50+ Death’, it can only be foreboding. And rightfully so, the album’s closer lifts the intensity with another sprawl of guitars and pounding drums, until Bollard’s jamming tendencies take over and the track meanders away. The album highlight comes at ‘Yourself’, perhaps the only moment where Bollard’s pop craft sneaks past the walls of sound. It’s still full with noisey guitars, frantic playing and an off-kilter beat, yet as Walsh’s passionate vocals cut through the murk, there’s a wide-eyed energy that isn’t felt in the same way elsewhere. Overall, Trawlers is a chaotic and wild introduction to an exciting band - and although it can be a little challenging at times, with so much mayhem going on once you’re sucked in, it’s a difficult one to get back out of. We’re really excited to premiere Trawlers, and to celebrate the album’s release we spoke with Luke Scott, Benton Ching and Tom Walsh from Bollard to find out all about it. TJ: Hey guys, what’s the story behind Bollard? B: We kind of knew each other from uni, and started playing together in our bedrooms as a creative outlet when we all lived in North Melbourne a few years ago. I suppose we came together because of our love for bands like Sonic Youth, Dinosaur Jr, The Drones, and Gang of Four. This shared musical obsession meant we saw eye to eye on the kind of music we wanted to make, but we all brought our own individual influences into the mix as well. We’ve always wanted to find something that sounded distinctive and came up with plenty of ways to overcomplicate the process of making music. Basically, Bollard is four mates hanging out together, turning their amps up most of the way and banging out a few tunes. The album has been a long time coming, with the first single ‘Yourself’ coming out in June last year. How’s it feel to finally release it? Yeah, that was some time ago now! ‘Yourself’ was actually recorded by our friend Sam Heathcote a few months before the rest of the album. It's been both fast and slow at different stages of getting the album together - relatively quick to get it together and record it, but a little less so on the release side of things. The whole recording and releasing operation has been fairly new to us and we’ve had to take our time to make sure everything was ready for the release. On one hand, it’s cathartic having it out there after the long period of preparation but we’re mostly just excited to put a record that we’re all happy with into the big bad world, which was something fairly inconceivable when we first started playing together. Trawlers is a pretty wild journey - tell us a bit about the album and how it came about. Having played together for a while, we eventually got to a stage where we were writing songs that we were happy with (although we had to write plenty of bad songs in the process), which kind of led to us considering recording our music. What really motivated us to record an album was that Benton, our lead guitarist, got into a masters program in London. Having a limited amount of time gave us the impetus to put the album together. We recorded all eleven tracks with Aaron Dobos at Sing Sing studios over two days, which was quite frenetic for us given that we hadn't done much recording previously. As an album, Trawlers doesn’t quite have a core narrative. However, a central theme that ties the songs together is a shared tension. Lyrically, the songs on the album mainly involve taking on the personas of different characters, most of whom you might consider fairly ordinary folk on hard times, a little bit worn-down. These characters are developed by the experiences of growing up in both rural and urban Australia. Sometimes their stories play a central role in the song, whilst other times they might be used as a vehicle to convey more abstract ideas. Musically, this tension is something that we've tried to also preserve and portray sonically, dipping in and out of dissonant moments to achieve this. It's definitely heavily influenced by some of the bands mentioned previously, but also by more disparate genres like shoegaze, flamenco and jazz, particularly in the extended instrumental sections. It's always a bit tricky (and a bit strange) describing your own music - but we hope Trawlers is a journey you like being on! With so much energy packed into these tracks, I’m pretty confident that a Bollard live show must be a pretty chaotic, intense affair. What’s your experience been performing the album live? We’ve played to empty rooms and packed rooms, and both have been heaps of fun and great for our development. For us, performing live plays a big part in the writing process - we don’t think of our live shows as a showcase of a finished product. Instead, it’s an opportunity to experiment and figure out what’s working and what isn’t. For this reason we try to make sure we never play the same set twice, whether that means testing out a couple of new songs or extending a jam or trying a new cover or whatever. A big part of our sound comes from extended improvised jams, which is something we enjoy incorporating into our live show but didn’t quite get the chance to do in the recording process. What’s up next for Bollard? In the immediate future, we’ve got an album launch coming up in May at Bar Open. We've just got a new guitarist, Ju Shung, so keep an eye out for him at the show. We'll also be gigging a bit for the rest of the year, and plan to fit in a drive up the east coast to play a few shows. Other than that, we’re working on writing more music which might lead to album two somewhere down the line. Have a listen to Trawlers above, and follow Bollard on Facebook to keep updated on their upcoming shows.